“Recruitment will begin soon for a phase 3 trial that will compare intralesional PV-10 with chemotherapy in patients with stage IIIb or IIIc melanoma, according to a presenter at the HemOnc Today Melanoma and Cutaneous Malignancies meeting. “The analysis will include 225 patients. Two-thirds will be randomly assigned to monthly injections with PV-10 (Provectus), a sterile, non-pyrogenic solution of rose bengal disodium that destroys tumors by necrosis. The other patients will be assigned standard-dose chemotherapy with dacarbazine or temozolomide. “All patients must have cutaneous and subcutaneous disease with no active nodal disease, and all lesions must be BRAF wild type. All patients must be either refractory to or not candidates for systemic immunotherapy. The gist: Earlier this month we posted about promising results from a clinical trial testing a new treatment called PV-10. Now, an oncologist who was not involved in the research has told a Forbes reporter that the results may not be as promising as they sound. “A new cancer drug benefited 51% of stage III and IV melanoma patients during a phase II trial, achieving complete response (total cancer disappearance) in 26% during the treatment period. That was all in just 16 weeks of treatment, and would seem to suggest this drug, being developed by a small company ignored by Wall Street, has potential for treating certain cancers in the future. “But an independent oncologist not associated with the trial says that the results may not be so impressive after all, based on the data from the published study. “John Glaspy, an oncology professor at UCLA, says that ‘it’s not clear’ whether the result are important. If they are talking about lesions that were not directly injected with the drug, the results would be meaningful. ‘If they are talking about the injected lesion, not so much,’ Glaspy says. 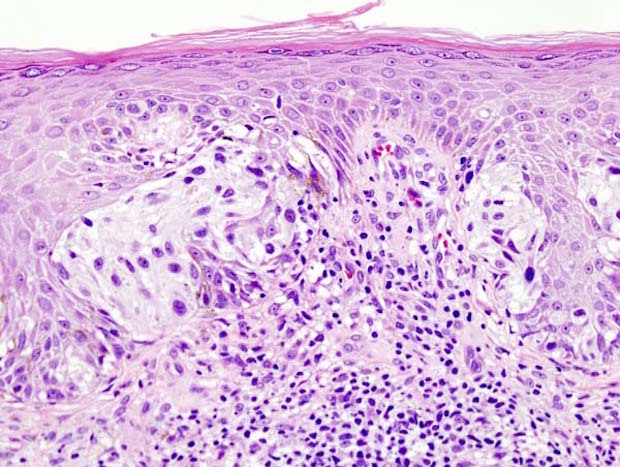 The gist: A new treatment has shown early promise for treating people with cutaneous melanoma that worsened after previous treatment. The new treatment involves injecting a substance called rose bengal disodium into melanoma lesions. It was tested in volunteer patients in a recent clinical trial. The treatment proved safe, and 51% of the patients experienced a good response. “Intralesional injection of rose bengal disodium was well-tolerated in patients with refractory cutaneous melanoma, with just over half of patients meeting the primary study endpoint, according to a poster presented at the European Society of Medical Oncology Annual Congress. “Researchers included 80 patients with 6.3-cm median sum lesion diameter in biopsy-confirmed melanoma that was refractory to a median of six previous interventions in the study. The patients received intralesional injections of rose bengal disodium (PV-10) in up to 20 cutaneous and subcutaneous lesions up to four times during a 16-week period. Follow-up was 52 weeks. “The researchers assessed best overall response rate (BORR) in up to 10 injected target lesions, and secondary endpoints included the assessment of response duration, BORR of untreated bystander lesions, overall survival and adverse events. Editor’s note: PV-10 is a new drug that can be injected directly into a cutaneous melanoma tumor. In a recent clinical trial testing the drug on volunteers, half of all patients who had all of their tumors injected experienced complete disappearance of their tumors. Editor’s note: This story is about a new treatment called PV-10 that is injected directly into melanoma tumors. A clinical trial to test the drug in people with melanoma has shown promising results. The manufacturers of the drug have submitted an application for “breakthrough therapy” designation from the U.S. Food and Drug Administration (FDA) to expedite the FDA-approval process and rapidly make the drug available to many more melanoma patients in the U.S.
Will PV-10 Injections Shrink Melanomas in People, Too? A new phase I clinical trial is underway to see if an experimental melanoma treatment works as well in people as it does in mice. The treatment entails injecting tumors with PV-10. A previous study in mice showed that just one PV-10 injection was enough to shrink melanomas. In addition, very early trials suggested that PV-10 boosts the immune system and the mouse study suggested that this treatment has fewer side effects than current immunotherapies. The new trial will assess whether PV-10 shrinks melanomas and keeps them from spreading in people, as well as whether PV-10 actually boosts the immune system. This trial is currently accepting participants. The ASCO Post. Aug 28, 2013.